I am big on hair products. I buy and buy and buy, and then just keep buying! I have cabinets stuffed full of hair products, and practically everyone I know has been gifted a hair product before. I love shiny, smooth hair. I WANT shiny, smooth hair. 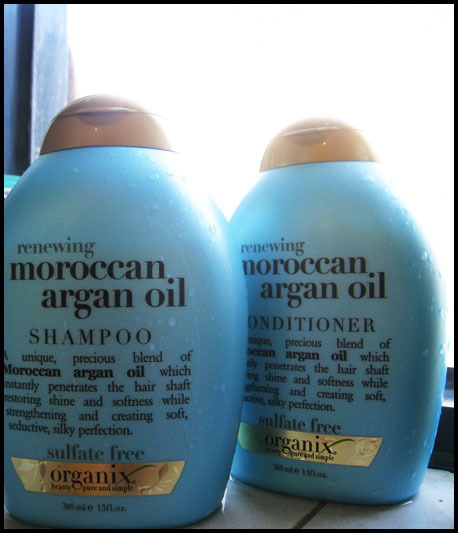 Being such a huge fan, I'm ashamed to admit that before this, I had never tried the famous Moroccan oil, in any form. So when Organix offered me a chance to trial this shampoo and conditioner, I said definitely, yes! Indulge the senses with a nourishing formula that is free of sulfates, phosphates and parabens. Safe for color-treated hair, the Moroccan Argan Oil Shampoo and Conditioner will restore moisture to dry hair and stimulate the scalp to create a cleansing and rejuvenating experience. I've been trialling this shampoo for just about 3 weeks now. I've got mixed feelings about this shampoo, and I can't quite decide if it's the shampoo for me. My first thoughts about this shampoo were "How wrong can you go with Moroccan argan oil?" and "Oh my heavens, this smells good!" Because my hair smelled so good, I was pretty much counting down the hours till I could hop into the shower again. Immediately after showering and air-drying, though, my hair would become a frizzy, stiff mess. It would get tangled, slightly stiff (I usually have relatively soft hair), and difficult to manage overall. But then a few hours later, my hair would start to lose its stiffness, and the frizz would disappear. Then, my hair would start to fall into place (with a little help from me, raking my fingers through them every few hours or so) and end up looking smooth, silky, and thick. See the cause of my confusion here? Just for reference, I have very Asian hair - thick (strand-wise, not number of follicles-wise), very slightly wavy, usually pretty smooth. It's not lacklustre, but not as shiny as I'd like it to be, either. I also have a semi-oily scalp. Depending on the type of shampoo I use, it can be completely normal, or it can get really oily and weighed down. I think this would definitely work a lot better on people with hair not quite as thick as mine - if you have a lot of hair but each strand is fine (which is the case for most Caucasians), then you should consider getting this shampoo. Also, I think this would definitely work a lot better for people who style their hair in the mornings - because they wouldn't experience the same 'cooling-down' period that my hair seemed to need before it fell into place properly. The shampoo and conditioner retail for AUD 19.95 each at Coles, My Chemist, Chemist Warehouse, and selected pharmacies.